Numerous customers have expressed the need and desire to have help planning and/or visualizing a garden space. 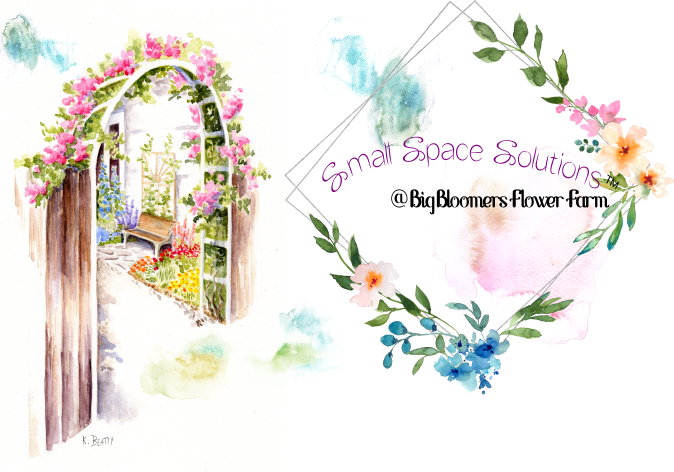 We are excited to offer a solution . . .Small Space Solutions. Pick any area up to 200 sq. ft.—a mailbox bed, a front entrance, a pollinator garden or even a secret garden! If you have a larger area to work with, feel free to break it down into manageable 200 sq. ft. plots. Download the graph paper and draw a sketch of the area. (1 square = 1 foot) Include any existing structures, trees or plantings. Fill in the answers on the SSS Worksheet and bring it to your consultation. As well, bring several pictures from different angles. Inspiration from magazines or Pinterest are encouraged too. When you are ready, schedule a consultation. *One hour (20 min. in-person consult + 40 min. after-consult design) is designated per Solution. There is no charge for the Design Consultation/Service. We simply ask that you purchase a $100 Big Bloomers Gift Certificate to use toward the purchase of plants, soil amendments, yard art, etc. that you will be using to complete the design. So, let’s get started! Appointments are 11:00 and 2:00 on Sundays. *Consultations may also be used for designing containers for a patio, balcony or pool area. Need interior plantscaping? That’s a Small Space Solution too!